That title was just to get your attention. I wanted to get a jump on all of the celebratory things that will soon start, as the 150th anniversary of the start of the American Civil War approaches. An attack on Fort Sumter, on April 12, 1861, got the whole thing going and for the following four years we had a big family dispute. For about forty years now, and given that amount of time you'd think I'd have things in better order, I've been working on our family genealogy. Along the way, I found a number of family members who were in the Civil War and even have copies of federal military documents to prove it. I've also been able to find some pictures of great-grandfathers who were in the war, and one that I believe is a relative of my great-grandmother, pictured in the upper right. Unfortunately, people didn't write on the backs of pictures a lot so his identity is lost to us. 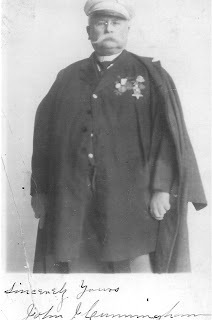 Perhaps some Civil War expert could identify the unit he was in, based on uniform, but it's a blurry sort of picture so the words on the hat and buttons are unreadable. We've made two trips "down south," from here...one to Gettysburg and another to Fredericksburg. If you haven't been, both are well worth your time. We traveled there to check out the military and history offerings, but there's plenty else to do there if you're not on a Civil War bend. My great-grandfather, Henry King, was in the Civil War. He was a bugler with Company "A" of the 134th New York Infantry. There's a book about their exploits and I heard, via a family story, that up until they sold their farm in Glenville his Civil War uniform and bugle were in the house. Well, the house is gone as are the war artifacts. 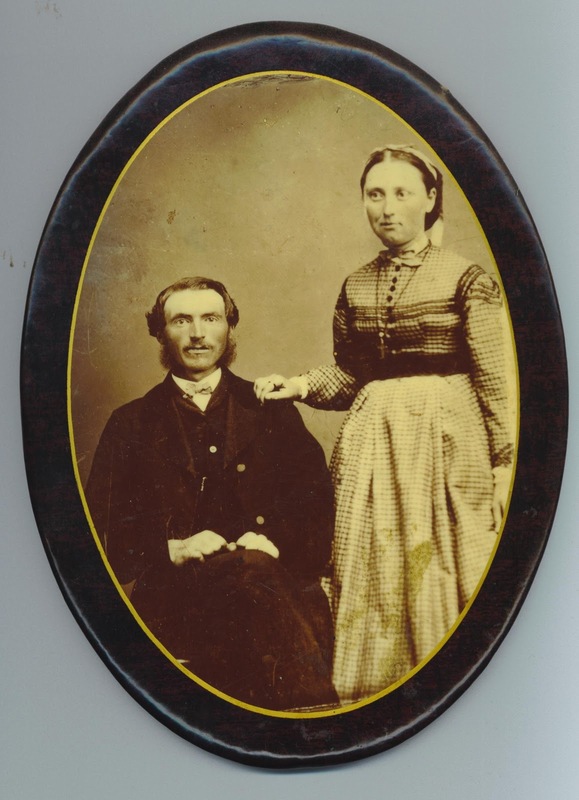 The only picture I have of him is his wedding photo, here on the left, taken in 1868...he married after the Civil War, was wounded at the Battle of Gettysburg, survived the balance of the war, and then settled into the life of a farmer. His records show exploits that took him from Schoharie County, New York all the way to Savannah, Georgia! 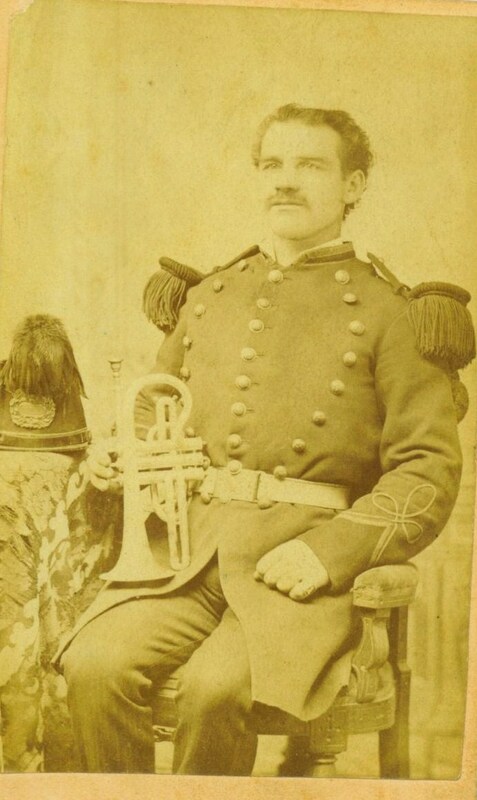 He was a bugler, an infantryman, a coxswain at Fort Chemung, and apparently did a lot of walking. After all of that activity he was honorably discharged in Savannah, Georgia and had to find his own way home. 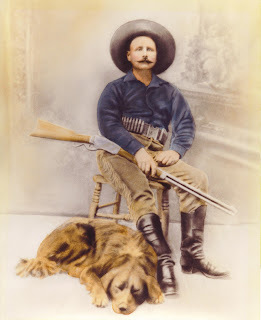 Then there was Great-Grandpa John J. Cunningham. He did the military thing twice. First a stint in the Civil War, 3rd New York Infantry, and then he re-joined the Army in 1871 and was stationed out West at Fort Buford, in the Dakota Territory. His adventures seemed much more personal in nature. About the only thing that shows up regularly in his military records are statements of "three days in brig for intoxication," "five days in brig for intoxication," "week in brig, intoxication," and "returned to unit after unknown absence." Hey, some of us are fighters, some are lovers! I'll publish some stories later on about the many wives and children of John J., but for the meantime, I'll just share some pics of him in his uniform (or one that was made for him later on, I think he put on a few pounds over the years), as he looked nearing the end of his days in the New Jersey State Soldier's Home in Kearney, New Jersey. This is he on the right during those later years. He was a traveling sort of guy. The picture below, on the left, is one that was taken when he was out West. He had written home and said he met Bat Masterson, and Wild Bill Hickok and even knew Belle Starr (the latter was most likely true). But I digress...the point of this was to "kick off" the coming four years of a re-look at the American Civil War...seems many people can trace themselves back to someone who was involved in that great confrontation. I don't have any diaries or family stories that come down about the Civil War...just that they were in it. The military records and pension papers I have note little about daily activity, the things they saw or did, or where they ended up, but more about the condition they were in later on in life. During our trip to Gettysburg, we visited the National Museum there and hired a tour guide who took us around the battlefields...well worth the money! The minute I showed the guide the name of Great-Grandfather King and the unit he was with, he changed up the whole tour and led us around from the vantage point of what he might have seen or dealt with that day, from the start of the battle to the end. He knew where the regiment was placed during the battles, what divisions they fought, and more! Seems Great-Grandpa King held off the southern troops for two days. I guess he had some help, but he was in a prominent position at the front of the battle. Shot on the second day of the Battle of Gettysburg, he was soon off to a hospital to mend and then back to the war after a short healing period. The stories the guide told us would probably have been similar to those of my relative, as he related his days in the Union Army, and especially at that epic battle, to his family. None of his immediate family survive, so those personal stories are lost to time. However, he did have eleven children, so perhaps his days on the battlefields prepared him for any possible civil unrest at home! And, when the kids complained about how far they had to walk to school in a snowstorm, in Glenville, New York, he could drag out a map and show them where Savannah, Georgia was! Did my genealogy once, all the way back to my grandparents. Okay, how many generations was that?